The Calgary Flames - From 80 Feet Above: Will the 2013-14 Flames supplant the 1997-98 team as the worst in franchise history? Will the 2013-14 Flames supplant the 1997-98 team as the worst in franchise history? The writing is on the wall alright, like a vibrant three-storey mural on the side of a building in Kensington. This year's edition of the Calgary Flames -- less Jarome Iginla, Miikka Kiprusoff and Jay Bouwmeester, should be plain old awful. Oh, there will be a Gary Coleman-like cuteness to the team for a while with all the new faces and influx of youth. For the first couple months, invigorated fans will want to grab the players by the cheeks and give them a kiss. But what's adorable in October may be deplorable by March as losses mount and the grind of playing in the rugged new Pacific Division takes its toll. By the trade deadline, fans may want to give the team a shake instead. When the season wraps up April 13 with one last merciful visit to the Pacific Time zone and a date with Vancouver at Rogers Arena, will this year's Calgary Flames be putting an exclamation mark on the worst season in franchise history? That's what I'm here to debate. The score to beat is 67 points amassed by the 1997-98 edition of the Calgary Flames, who went 26-41-15 under the guidance of newly hired head coach Brian Sutter. Last year's club, if you're curious, was on pace for 71 points over a full season if you do the math. Close, but not quite -- even if you subtract the bonus points. The expansion Atlanta Flames in 1972-73 hold the franchise record for lowest point total of 65, but that was achieved over a relatively short 78-game schedule so averaged out, even that outfit ranks ahead of the 1997-98 Flames. The 2013-14 Flames... For the first time in a long time, they don't have that de facto go-to guy. Not overly relying on one player can be a good thing but it can also be a sign of thin resources. I recently wrote how 11 different players have a legitimate shot to lead Calgary in scoring this year. The most talented of the bunch is left-winger Sven Baertschi, but he's a month away from turning 21 and putting the team on his shoulders at this stage in his career is a lot to ask. There's a solid supporting cast that are back in sharp-shooting Curtis Glencross, Mike Cammalleri, Jiri Hudler, Lee Stempniak and Matt Stajan who bounced back nicely last season with a very consistent year. However, centre is a weakness where Mikael Backlund gets the top rung by acclamation and untested, fresh-out-of-college Corban Knight may even jump straight into the line-up. Sixth overall pick Sean Monahan is a possibility too, but is likely headed back to junior. Roman Horak figures into the forward mix also while David Jones and TJ Galiardi are new acquisitions with experience, who are looking for a fresh start. Grit comes in the form of Tim Jackman and Brian McGrattan. The 1997-98 Flames... Comparably, they were a younger group. Gone were veterans Dave Gagner, who left in the summer as a free agent, and Gary Roberts -- recovering from a neck injury that led to his temporary retirement and the missing of the 1996-97 season, who unretired and was traded to Carolina. That left only one regular up front who had celebrated a 30th birthday and that was 32-year-old German Titov. Theoren Fleury, 29, was the offensive catalyst and pretty much a one-man show. Fleury lead the team in goals (27), assists (51) and even penalty minutes (197). His 78 points were 29 better than next-best Cory Stillman. Joining Titov up the middle were Andrew Cassels, Michael Nylander and dependable Jim Dowd, who tied for the team lead at plus-10. Other key players up front included Jarome Iginla, who fell to 13 goals in his sophomore year after firing 21 as a rookie, Marty McInnis, Hnat Domenichelli, Jonas Hoglund -- before being dealt to Montreal in February for Valeri Bure, Sandy McCarthy -- before being dealt to Tampa Bay in March for Jason Wiemer, and Chris Dingman. > Edge - 2013-14 Flames will be slightly worse. There is no clutch go-to guy like Fleury and in tight, low-scoring games, that will mean the difference between picking up 1 or 2 points versus suffering a regulation loss. Baertschi may become that guy eventually but he's not there yet. Cammalleri, Stempniak and Stajan are solid players but both are pending UFAs and could very likely be traded away. That will leave the team with voids and while Calgary has begun to assemble some nice, young talent in the pipeline, they're not ready to step-in and make an impact at the NHL level yet. The 2013-14 Flames... The four main pieces are comprised of veterans Mark Giordano, Dennis Wideman and Shane O'Brien -- who are all born within eight months of each other and will all be 30 by the start of the season, along with rising star TJ Brodie, who is just 23. They're complemented by an assortment of pieces in Kris Russell, Chris Butler, Derek Smith and Mark Cundari. The future is bright with Patrick Sieloff and Tyler Wotherspoon on the way but it's doubtful either will be a factor this season. The 1997-98 Flames... In a blend of experience and youth, elder statesmen James Patrick, 34, and Tommy Albelin, 33, were surrounded by a bunch of prospects under the age of 25. Nineteen-year-old Derek Morris was the youngest of the lot, which also featured captain Todd Simpson, Cale Hulse, Joel Bouchard and Jamie Allison. > Edge - 1997-98 Flames were worse. Brodie, who is older and more experienced, gets the edge on Morris as the token prize prospect. While veterans Patrick and Albelin may have brought a bit more to the dressing room, there's also some good character in the younger trio of Giordano, Wideman, and O'Brien and the latter are more dynamic on the ice. While Hulse and Simpson would have the edge over Russell and Butler, it's not significant and Cundari is a dark horse who could really be a pleasent surprise this year. The 2013-14 Flames... With much optimism, Calgary turns to North American newcomers Karri Ramo and Reto Berra to replace Kiprusoff, who was the single most important cog on this team the past decade. As I chronicled here in a recent article, Ramo's been on this side of the Atlantic before although it was a long time ago and the results were mixed. Like a favourite pair of sneakers you can't throw away, Joey MacDonald is still with the team to provide comfort if things fall apart but be under no illusion, it's about the 27-year-old Finn and 26-year-old from Switzerland. Can one or both of them show that indeed, last year they were the best goaltenders not in the NHL. 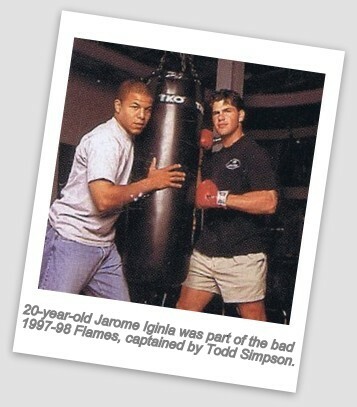 The 1997-98 Flames... With Trevor Kidd shipped out the previous summer as part of the Roberts trade, Calgary deployed a goaltending tandem of Dwayne Roloson and Rick Tabaracci. While both were 28 years old, Roloson was playing just his second NHL season. The more-seasoned Tabaracci, who had played for the Flames the previous year, was traded to Tampa Bay and then re-acquired in the summer, had played in parts of eight NHL seasons previously. The team goals-against-average of 3.07 that year ranked 22nd out of the league's 26 teams. > Edge - 1997-98 Flames were worse. Maybe. Calgary's goaltending this year really is the great unknown. It would be easy to look at factors like the inevitable adjustment that comes with playing on the small NHL ice in North America and ask how could these two unproven guys possibly be better. Firstly, you're only measuring them up against Tabaracci and Roloson. The knock on Roloson was he never won the team a game. He was good, but never spectacular. Tabaracci was no threat to win the Vezina either. Time will tell but Ramo and Berra, on the other hand, may possess the ability to steal a game -- Berra with his size, Ramo with his acrobatic style, although there will be some duds along the way. While Berra's track record statistically offers no assurances, those that watched him play regularly in the Swiss league say he's an excellent goalie. As documented in my 12 Neat Things About Reto Berra, he also had a great 2013 World Championships. It all comes down to goaltending. If this year's Flames get an excellent year out of Ramo and/or Berra, I would rank this team as marginally better than the 1997-98 team. However, Calgary finds itself in a tough division this year so while potentially being better on paper, I'd expect a point total in or around the same 67 point mark from 16 years ago. However, remember that this is not an apples-to-apples comparison given the prevalence of the three-point game now. So, 67 points today with the bonus points added in would be equivalent to a 62-63 point season by 1997-98 standards. More importantly than all that, what will the Flames do at the 2014 NHL Entry Draft, which will surely be their first top five pick in history? At the 1998 draft after finishing 22nd out of the 26th teams, the Flames got sixth pick. It would have been a top five pick except the expansion Nashville Predators, beginning play the next season, were awarded the third overall pick, bumping Calgary's draft slot down to sixth. Russian defenseman Vitali Vishnevski was the guy who went No. 5. The Flames selected Rico Fata at No. 6 and we all know how well that panned out. High draft picks to poor teams are how those teams are supposed to get back to being competitive. Instead, the Flames blew that pivotal rebuilding piece and by no coincidence, what followed was the Flames missing the playoffs for five additional seasons.